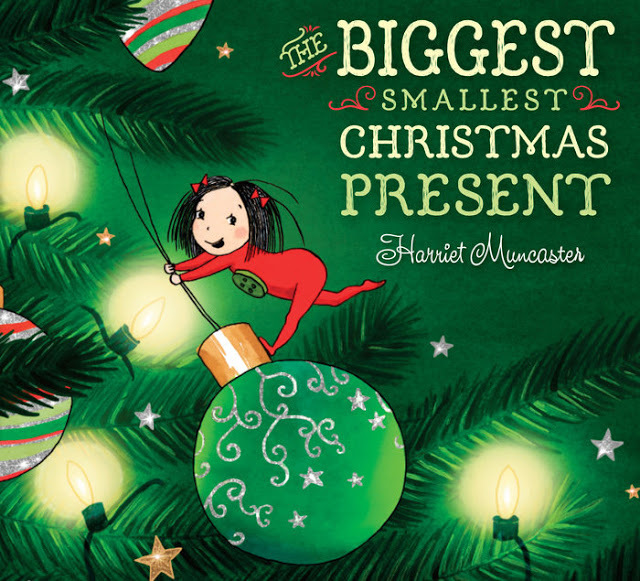 The Biggest Smallest Christmas Present by Harriet Muncaster. G.P. Putnam's Sons Books for Young Readers, 2016. I should have saved this one for Little Sis to review, as it is her favorite right now! She was already such a fan of Harriet Muncaster's Witch's Cat books, but this one really has her name written all over it! ... because Clementine is extraordinarily little! She is so tiny that she bathes in a teacup and sleeps in a matchbox. Unfortunately, Santa Claus hasn't figured that out yet. He brings her presents that would be perfect, if only they were scaled to her size! Her fairy dress-up set is lovely. One of the shoes replaces the matchbox as her bed! Her mother suggests they write a message to Santa with icing on a gingerbread cookie. Santa doesn't get the message. He leaves a puppy! She writes a message in the snow on her roof, but Santa misses that one, too. At last, Clementine's parents have the perfect idea. They leave photos of Clementine enjoying her massive gifts through the years. And this time, Santa leaves her another enormous present. Only this one turns out to be perfect for her. Can you guess what it might be? Harriet Muncaster wrote on her blog that this was her first full-color 2D-illustrated picture book. While I adore her 3D stuff (those Witch's Cat books! ), this book is just as whimsical and charming. We borrowed this one via interlibrary loan (thank you, Derby Public Library, just south of us! ), but Little Sis has requested her own copy! By the way, Harriet Muncaster's Instagram is one of my favorites! I love all the books you ve recently blogged about but this one's my favorite!We ve bought all the Christmas books we can for now, but I'm adding it to my wishlist for next year!